Acute mesenteric ischaemia is the sudden decrease in blood supply to the bowel, resulting in bowel ischaemia and, if not promptly treated, rapid gangrene. In this article, we shall look at the causes, clinical features and management of a patient with acute mesenteric ischaemia. The risk factors for acute mesenteric ischaemia depend on the underlying cause. Specifically however for AMAE, the main reversible risk factors are smoking, hyperlipidaemia, and hypertension, much the same as for chronic mesenteric ischaemia. Traditionally, mesenteric ischaemia presents with a generalised abdominal pain, out of proportion to the clinical findings, although it can often be more variable or subtle than this. The patient will typically complain of a diffuse and constant pain, with associated nausea and vomiting present in around 75% of cases. On examination, the abdomen is often unremarkable* and the patient may find it difficult to localise the pain. 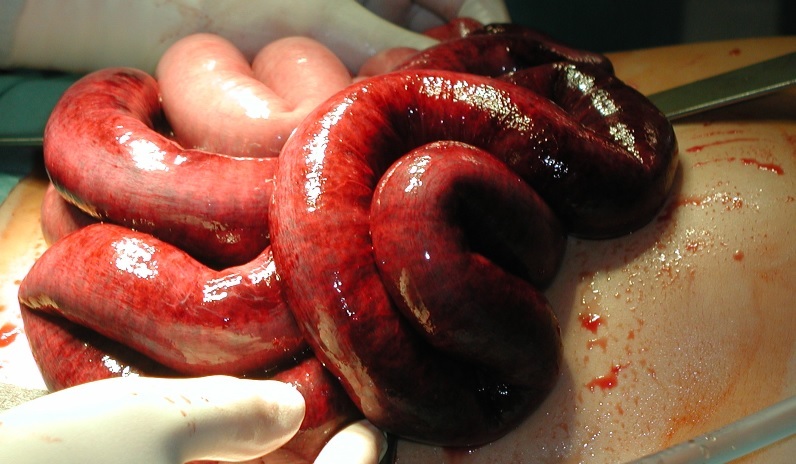 However, remember late stage bowel ischaemia and necrosis can present as bowel perforation. Importantly, take note of any potential embolic sources, such as AF, heart murmurs, or signs of previous valvular replacement surgery. An arterial blood gas (ABG) should be performed urgently, to assess the degree of acidosis and serum lactate, secondary to the severity of bowel infarction. *Whilst an amylase is commonly measured to exclude pancreatitis as a cause of the abdominal pain, counter-intuitively amylase also rises in mesenteric ischaemia, as well as ectopic pregnancy, bowel perforation, and diabetic ketoacidosis. Arterial bowel ischaemia will initially show on CT imaging as oedematous bowel, secondary to the ischaemia and vasodilatation, before progressing to a loss of bowel wall enhancement* and then to pneumatosis. Any suspicion of a bowel perforation warrants an initial AXR and erect CXR; if there is significant suspicion, then a CT abdomen with contrast is indicated. Acute mesenteric ischaemia is a surgical emergency, requiring urgent resuscitation with early senior involvement. Ensure the patient receives IV fluids, a catheter inserted, and a fluid balance chart started immediately. For confirmed cases, broad-spectrum antibiotics should be given, due to the risk of faecal contamination in case of perforation of the ischaemic (and potentially necrotic) bowel. The patient will have a significant acidosis and is at a high risk of developing multiorgan failure, therefore early ITU input to optimise the patient is necessary. Taking a patient to theatre for potential bowel resection without the support of ITU is likely to be futile. Post-operatively the patient should be on the intensive care unit under sedation, planned for potential relook laparotomy in 24-48 hours; the majority of patients will end up with a (either covering loop or end stoma) and there is a high chance of short gut syndrome. 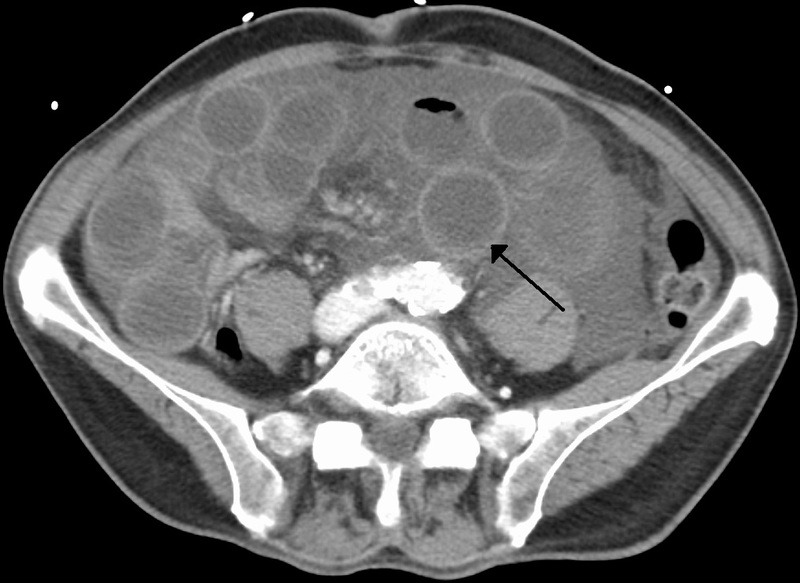 The main risks from mesenteric ischaemia are bowel necrosis and perforation. Mortality is around 50-80%, even if the diagnosis is made and treatment performed; those that survive may have short gut syndrome. A moderate rise in amylase can be seen following mesenteric ischaemia, which of the following is a rise in amylase not typically seen? What is the gold standard investigation for suspected acute mesenteric ischaemia?